Pancake breakfast made possible with coconut flour and happy, local eggs! This recipe was recommend to me by my friend Alexx who is also eating for Candida balance. At the time I was experimenting with a batter recipe I have, turning it into savory dinner pancakes. That recipe is a bit more complicated so lets start with this basic recipe for light and fluffy pancakes! You can make it sweet with stevia, vanilla (or another extract you like) or maybe some orange zest and cinnamon. Or savory with the addition of dried herbs, fresh chives and pepper. Savory pancakes would go well with a bit of fresh goat cheese or fried eggs and the sweet version could be topped with yogurt or eaten plain. 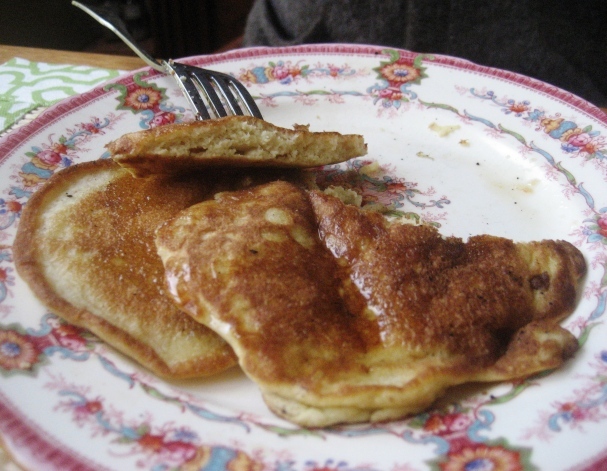 This recipe makes a lot of pancakes, I cut it in half and got about 9-10 pancakes. If you want to experiment with flavors and additions, make up the whole recipe, divide it into two bowls and then add different flavorings to each batch. The batter will keep for a few days in the fridge or on the counter top. I made my breakfast batter up the night before and left it out on the counter, covered with a cloth, to let the fermentation process start. This is a great short video on fermenting foods and their health benefits! Pre-heat griddle over medium-low heat. In a small bowl beat eggs until frothy, about two minutes. Mix in milk, vanilla, and stevia OR herbs and spices. In a medium-sized bowl combine coconut flour, baking soda, and sea salt and whisk together. Stir wet mixture into dry until coconut flour is incorporated. The batter will be thicker than regular pancake batter. You can cook the pancakes now or leave the batter out, covered with a cloth, overnight to begin the fermentation process which will aid digestion. Grease pan with butter or coconut oil. 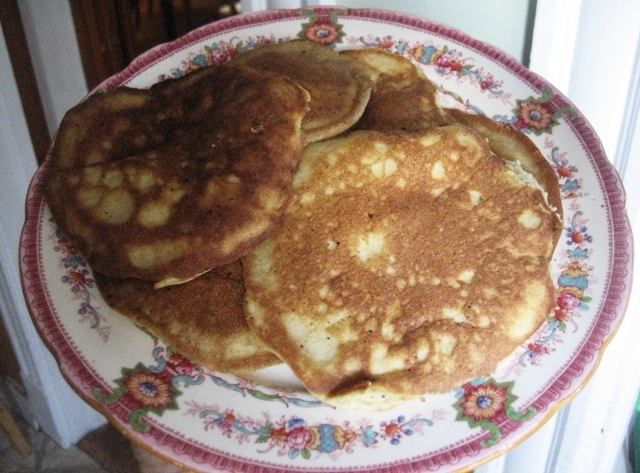 Ladle a few tablespoons of batter into pan for each pancake. Spread out slightly with the back of a spoon. The pancakes should be 2-3 inches in diameter and fairly thick. Cook for a few minutes on each side, until the tops dry out slightly, bubbles form and pop on the surface and the bottoms start to brown. Flip and cook an additional 2-3 minutes. I’m so excited to try ALL your recipes, thanks so much for this info. I will repost taste findings by month end when I’ve had time to fix/eat/enjoy them all. lovely recicpe but am allergic to eggs what can I replace it with instead? Hmmm, that’s a tough one since the eggs are what holds these together. You can try a ‘flax egg’ substitute, it works in cookies but I’m not sure how well it would work for pancakes. Please check out the last ingredient listed in this cookie recipe: https://thecandidadiaries.wordpress.com/2011/04/25/nuts-and-seeds-cookies/ : 3 T ground flax whipped into 1/4 cup of water is about the equivalent of two eggs. I think you could successfully make the Nuts and Seeds Cookies by doubling the ‘flax eggs’ and omitting the other two eggs. Give it a try with the pancakes too and see if it works. Also, are you allergic to the whites, the yolks or the whole egg? Some people have an allergy to just part of the egg and so can use the other part in recipes! Oh, sorry about that! Not sure what I can do, perhaps you can unsubscribe and then sign up again but, don’t check off that box?! Thanks so much for visiting my blog. I made it according to the recipe, and it was very thin… I poured it onto the hot pan and found it very difficult to flip when it got bubbly… so I thought, “it must be too thin, I need more coconut flour”, at which point I added too much, so I then added more milk… after some experimentation I found out that the original recipe was perfect (adding more milk and flour made it too mealy), and I just needed to wait for it to cook a little longer to be easier to flip! So don’t freak out if the batter is thin like I did, it’s a great recipe! lol. Hi Sara, it’s always interesting working with new ingredients and learning how they work with other foods! Happy to hear you worked it out, I like to let the coconut flour sit for a few minutes after I mix in the wet ingredients to allow the coconut flour to fully soak up all the moisture that it can before adding anything else in. Enjoy the pancakes! !